Our very popular intumescent letter box system consists of a high performance, self adhesive backed, PVC laminated intumescent material which has been designed to line the aperture of letterboxes in fire resistant doors. On exposure to a fire the liner will rapidly expand (intumesce) to seal the aperture and stop the spread of fire, smoke and hot gases through the door. The liner has been independently tested in accordance with BS476: Part 22: 1987 and can provide in excess of 1 hour fire resistance. 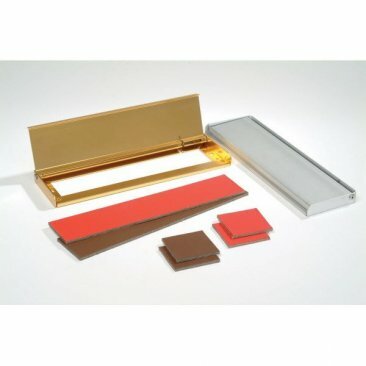 Supplied in packs containing sufficient material to suit any size aperture up to 250 x 50mm and can be used in both 1/2 and 1 hour fire door assemblies. Liner colours - Brown & Red. Letter plate colours - Brass and Satin aluminium effect.